In the opening decades of the twentieth century, Germany was at the cutting edge of arts and humanities scholarship across Europe. However, when many of its key thinkers - leaders in their fields in classics, philosophy, archaeology, art history, and oriental studies - were forced to flee to England following the rise of the Nazi regime, Germany's loss became Oxford's gain. From the mid-1930s onwards, Oxford could accurately be described as an 'ark of knowledge' of western civilization: a place where ideas about art, culture, and history could be rescued, developed, and disseminated freely. The city's history as a place of refuge for scientists who were victims of Nazi oppression is by now familiar, but the story of its role as a sanctuary for cultural heritage, though no less important, has received much less attention. 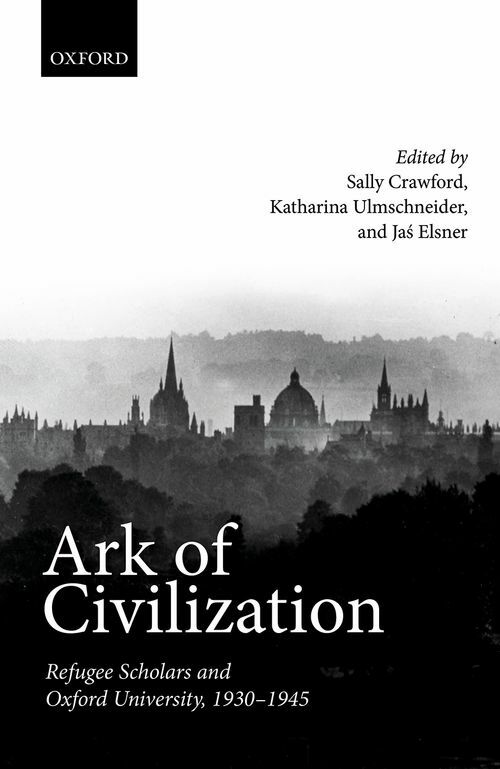 In this volume, the impact of Oxford as a shelter, a meeting point, and a centre of thought in the arts and humanities specifically is addressed, by looking both at those who sought refuge there and stayed, and those whose lives intersected with Oxford at crucial moments before and during the war. Although not every great refugee can be discussed in detail in this volume, this study offers an introduction to the unique conjunction of place, people, and time that shaped Western intellectual history, exploring how the meeting of minds enabled by libraries, publishing houses, and the University allowed Oxford's refugee scholars to have a profound and lasting impact on the development of British culture. Drawing on oral histories, previously unpublished letters, and archives, it illuminates and interweaves both personal and global histories to demonstrate how, for a short period during the war, Oxford brought together some of the greatest minds of the age to become the custodians of a great European civilization. Sally Crawford is a Senior Research Fellow at the Institute of Archaeology in Oxford, where her research into the archives in collaboration with co-editor Katharina Ulmschneider has led to myriad exhibitions, lectures, and publications on the history of archaeology. She is a Fellow of the Society of Antiquaries, Co-Director of the Historic Environment Image Resource, co-founder and Chair of the Society for the Study of Childhood in the Past, and monograph co-editor of the series Studies in Early Medicine. ; Katharina Ulmschneider is a Senior Research Fellow at Worcester College, Oxford, a Fellow of the Society of Antiquaries, and an Associate Member of the Society of Archivists. She has published widely on medieval archaeology and economy and also on the impact of metal detecting in archaeology, and her co-edited book Markets in Early Medieval Europe won the British Archaeology Book award in 2004. Since 2013 she has been Co-Director of the Historic Environment Image Resource alongside Sally Crawford. ; Jas Elsner is the Humfry Payne Senior Research Fellow in Classical Archaeology and Art at Corpus Christi College, Oxford, as well as Visiting Professor of Art and Religion at the University of Chicago. He is widely published and serves as the joint editor of two monograph series, Greek Culture in the Roman World and Ashgate Studies in Pilgrimage. Since 2013 he has been Principal Investigator on the Empires of Faith Project between the British Museum and Wolfson College, Oxford, which explores the visual cultures of world religions in the Mediterranean and Asia between 200 and 800 AD and will form the basis of a forthcoming monograph series from Oxford University Press.